The Fourth Padtselling Trulku Kunzang Thinlay Namgyal as born at Paro Drugyal Dzong in 1892, the Water Dragon Year. His father was Choje Thinlay, the Dzongpon of Drugyal Dzong, from Langthal Kibser Monastery in Trongsa, Central Bhutan, and his mother was Gyalmo of Taktsi Choje, a nobility family. He started to recollect his past life from the age of five and he was enthroned at the monastic seat of Jangchub Pelri Monastery as the reincarnation of the Third Padtselling Trulku at the age of five. Rigzin Khamsum Yongdrol, said to be the reincarnation of Dorji Lingpa (1346-1405), supervised the enthronement and gave him new names: Kunzang Ngedon Tenzin Chogyal, Om Swati, and Kunchab Jurme. Rigzin Khamsum Yongdrol offered an eight-stanza long-life prayer to Kunzang Thinlay Namgyal. He received Nyingma and Kagyu teachings from numerous masters during their visits to Bumthang, including the Eighth Karmapa Khakyab Dorji (1870/1871-1921/1922), Tokden Sakya Shiri (1853-1919), Terchen Zilnon Namkhai Dorji, Serkhang Dorji Chang Ngawang Tshulthrim Donden (1856-1918), the Seventh Dzigar Chogtrul Ngawang Tenzin Palzang, Doring Trulku, and Dzogchen Khenpo Thubten Nyandrak (b.1883). He also studied Zhungrig from Geshe Mindu and Tshulthrim Pelzang. He received a number of Nyingma transmissions and teachings from Bayul Rinpoche Kuzhog Thinlay and Chung Trulku, including Longchen Nyingthig, the treasure teachings of Drime Lingpa (1700-75/6), also known as Tekchen Lingpa, and the Vajra Kilaya treasure tradition of Ratna Lingpa (1403-1478). From the Ninth Peling Sungtrul Tenzin Chogyal (1894-1925), he received instruction on Peling Chokor. He took lay ordination vows from Chung Trulku. At that time, a devil living beneath the Chamkhar Bridge was harming the Chamkhar Chupo’s family. The family tried every means to ward off the devil but to no avail. At last they invited Kunzang Thinlay Namgyal to perform the necessary ritual. Kunzang Thinlay Namgyal agreed and went to Chamkhar. When he arrived at Chamkhar, the devil appeared in person and started to cry, and pleaded him not to perform the ritual. If he was to perform the ritual by all means, the devil requested him not to accept any offerings from the family, for that was tantamount to taking away his sok (life force), to which he agreed. After the ritual, the family made offerings to Kunzang Thinlay Namgyal but he refused to accept them, for he had a promise to keep. The family was unsatisfied and secretly hid some clothes underneath the saddle of his riding pony. When he arrived at Chamkhar Bridge, the devil appeared before him, crying, and complained that he had accepted the offerings, and that he would now die. Kunzang Thinlay Namgyal paid no heed to his cry and continued on his journey. The devil pulled his horse by its tail. As the horse moved forward with great force, it left a hoof print on a stone near the riverbed at Chamkhar. The devil beneath the Chamkhar Bridge stopped harming the people. The stone bearing the hoof print of the horse was taken to the monastery by some elderly people after it was removed from the original site while building the motor road. 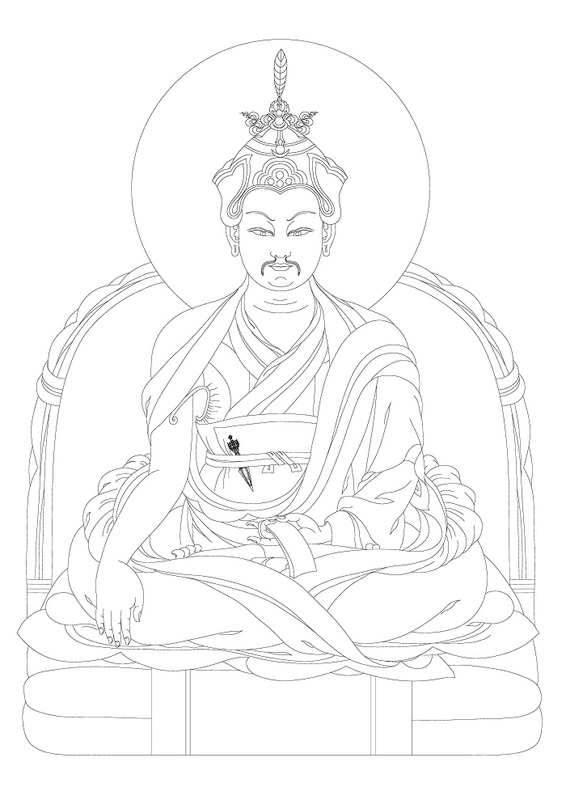 Kunzang Thinlay Namgyal continued the works of his predecessors: teaching the people and helping the sentient beings. He served as the head lama of the first two successive kings of Bhutan: Ugyen Wangchuck (1862-1926) and Jigme Wangchuck (1905-1952), including Azhi and Dasho of Lam Pelri and Wangdicholing royal collateral houses, Royal Chamberlain Honchung Dasho Zhongarpa, and others. Kunzang Thinlay Namgyal while mixing with high-ranking people also lived by strict rules of Palden Drukpa. Even when he went around for alms in the villages, it is said that he lived in the houses of village couriers and the people had to bring the offerings to him. Kunzang Thinlay Namgyal spent most of the time at his monastery over-seeing the management of the place and performing the timely rituals for the welfare of all sentient beings. He died in 1957 (Fire Bird Year) at the age of 66 year. His disciples and patrons requested him to stay a little longer. Alternatively, they requested him to be reborn fast for the benefit of all sentient beings. To this the master said that if he were to be born into a well-to-do family, he would not be able to benefit the poor and ordinary people. He promised to be born into a humble family in his next reincarnation and asked them to meet him there.